Maybe she was born with her fashion sense. Maybe she got it from years of studying the flashiest inmates at Arkham asylum. Say what you want about the supervillain, but Harley Quinn definitely knows a thing or two about changing styles. You remember when she went by Dr. Harleen Quinzel and she wore a lab coat and glasses, don't you? Well, as you can see her appearance is MUCH different now! 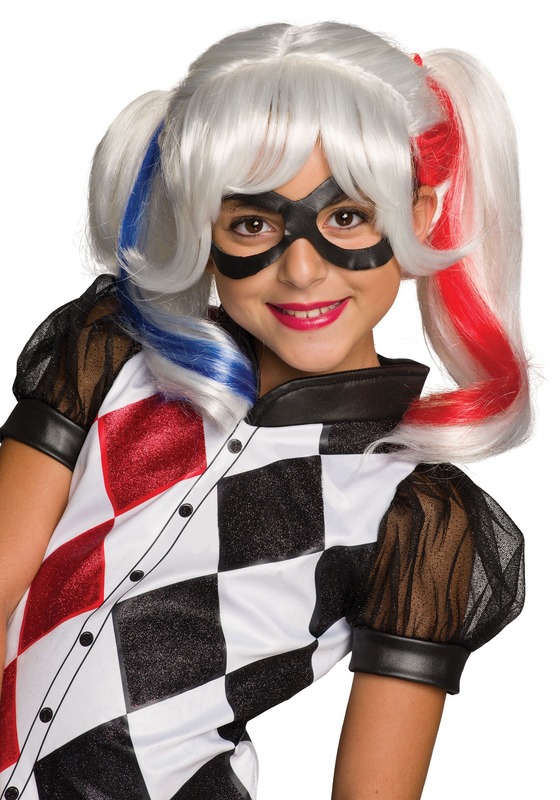 Your little supervillainess in training will love giving herself a complete makeover by using this cool officially-licensed wig. The DC superhero Harley Quinn wig is styled into pigtails via a middle part while also featuring blunt-cut bangs. The blonde pigtails have blue and red streaks so she'll achieve that crazy, eccentric look that Harley pulls off so well. Don't worry mom, she won't be dying her hair funky colors for a couple years yet, so for now you can relax and just enjoy watching her wear this fun wig!